Native Americans believed that all in nature was sacred. As such, individuals were given animal totems that symbolized (and beckoned) their inner strengths. Wearing an animal totem is what Native Americans call "good medicine" because it empowers the wearer to act in ways that show his or her strength. This captivating medicine animal--the cougar or mountain lion--is symbolic of leadership. The cougar is focused ferocity in action. He can see through darkness and is a swift and cunning hunter. Each piece of southwestern jewelry is handcrafted by artist Sandra Gingeroski. Handcarved from tupelo wood, each animal totem necklace is detailed with tiny needles using a process called "stoning" that gives dimension and texture to the piece. Sandra uses glass eyes to make each animal totem look breathtakingly real. Natural stones and bone pipe compliment sterling silver clasps and findings. This item is handmade to order. Plan ahead if you want to give this as a gift. We do not accept rush orders. Art cannot be hurried. Since each animal totem necklace is made with an individual in mind, please provide a brief description of the person for whom the necklace will be made. Put your description in the Comments Section of the Order Form. Since Sandra makes the animal spirit necklace while meditating on the person for whom it is intended, it is imbued with that person's energy and cannot be exchanged or returned. Give the gift of good medicine. 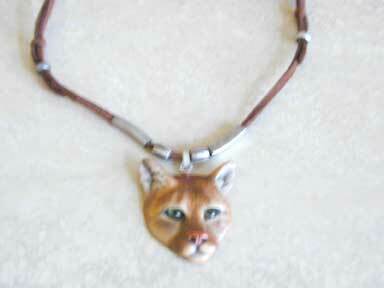 Reserve your cougar or mountain lion medicine totem necklace today.